The opposition to power reforms of the 1990s and their architect Max Bradford were a significant contributing factor to the loss of the seat of Otago for National’s Gavan Herlihy. David Parker, who won the seat, told a pre-election meeting in 2002 that they were one of the factors which motivated him to stand for Labour. But were they really so bad? Regulation and re-regulation aren’t the only factors which affected prices. The reliance on hydro generation puts pressure on supply and therefore price if there is a drought which reduces the water flow into the lakes behind dams. 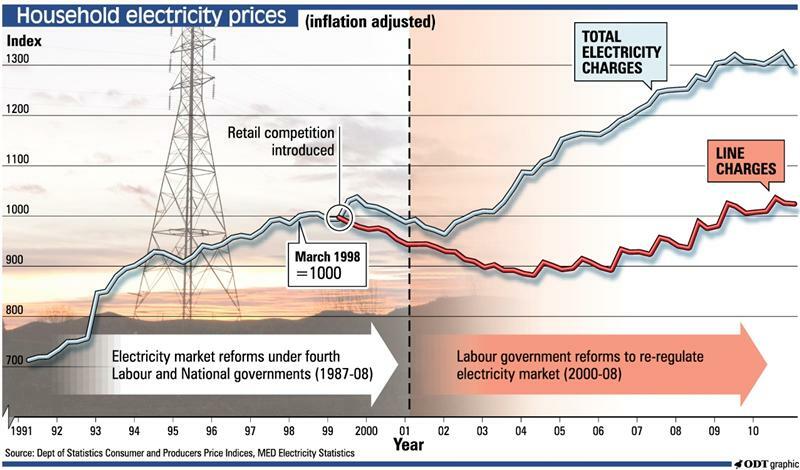 But prices went down when retail competition was introduced and went up again when Labour re-regulated the electricity market. National and Act are being criticised for a possible deal under which Act wouldn’t stand candidates in marginal seats. MMP allows such deals and it’s not very different from parties telling supporters how to rank their preferences under Preferential Voting systems. While there might not have been an overt deal before, minor parties have made it clear they aren’t seeking electorate votes in previous elections. I’ve attended meet-the-candidates meeting in Waitaki, and before that Otago every election since MMP was introduced and every Green candidate has told supporters s/he’s only interested in the party vote and they should give their electorate vote to Labour. Minor parties are unlikely to win electorate seats and when it’s the party vote that determines the make-up of parliament, not winning seats doesn’t affect how many MPs they get. But standing or not standing candidates in electorates can influence the outcome for those seats. In 1999 the Green Party candidate for Otago got 1,872 votes. In the 2002 election the party didn’t stand a candidate in the electorate and Gavan Herlihy, the sitting National MP lost to Labour’s David Parker by 684 votes. Act’s candidate Gerry Eckhoff got 1,294 votes and while not all those votes would have gone to National, enough probably would have to have enabled him to hold the seat. Not putting up electorate candidates can come at a cost. Regardless of whether or not they’re seeking electorate votes, having a candidate contesting a seat can help boost list votes. However, standing in every electorate is expensive and it also requires a party to have enough potential candidates, of sufficient calibre, to ensure they don’t do more harm than good. If a party doesn’t have enough resources – human and financial – to contest all seats properly, it’s better putting its efforts into the party vote alone.